During the first month until the Auto Focus stopped working, I was very impressed with this DSLR and Nikkor lens. Then suddenly the AF would not respond in the middle of outdoor shooting. I am waiting to hear what Nikon service center has to say. Searching a bit on the web I could read other D300 owners complaining about the same fault. If other people write about this issue I can guess this is not a rare case of technical failure, but rather a sign of insufficient manufacturing and quality level -and this should not happen with a camera of this class. So overall I am disappointed with Nikon. Nikon sent back the camera after about 2 weeks, which is ok since I had no urgent need for it. They were not very specific on the cause, just noted that the body had been repaired - the lens was ok.
Another positive comment on Nikon's repair center: they had the courtesy to send me an additional battery. This is GOOD customer service. Since then the AF is working fine and I am very pleased with the cameras capabilities and quality of the photos. On the performance scale alone I give this camera the full 5 STARS. OK, after reading all the online reviews and professional reviews and stewing over it for a few weeks I jumped on this one with the "kit" 18-200 VR lens. I am not a pro, although I have considered doing some pro work, but I take my photography seriously. My subject is mostly family/grandkids and local scenery. I am constantly experimenting with settings and never used the standard icon selections on the mode dial on my D50, so this camera seemed a natural upgrade to me. The 18-200 VR lens; I have taken pics at 1/30 of a second at full 200mm zoom that I wouldn't have thought possible. It really does prevent most motion blur. Besides the actual camera this was the best part of my purchase. I rarely miss a shot for need of changing lenses, my former lenses being an 18-55 and a 55-200. With the flexibility of the camera itself and my second lens being a faster 30mm f1.4 this is pure photography fun for me. I know that some pros have dissed this lens as being less than pro, with distortion at certain extremes and some blur in the midrange 135mm. For the photography I do this is not important. When I do notice some distortion it's not important and I have not seen any blur, though I may not be looking close enough. Auto-ISO: Still playing with this feature but the cool thing is that you can set it the minimum shutter speed you want and it will step up the ISO to keep that speed when needed. 1/30 seems a good speed with the VR lens, though there is sometimes subject motion blur (not camera motion blur), but this is also fun to play with. It can always be bumped up to 1/60 or more. External controls: Most of the commonly-changed options are at your fingertips which means you don't need to visit the menus as often. 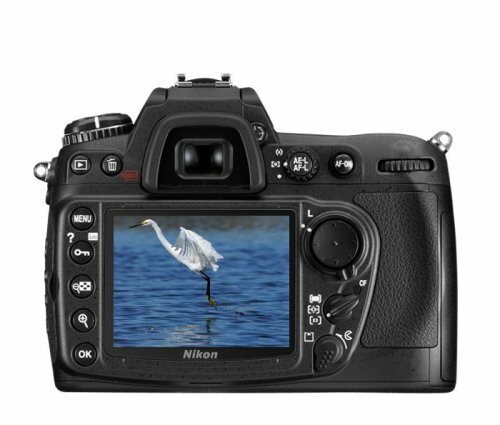 I have a friend with a D40x and most of the options are in menus and my D50 has some on external buttons. The D300 seems to have a good balance. You very clearly could not have put all the menu items on external buttons on this camera! Speaking of menus; I have a great fondness for the help feature available on this and on my D50. Not sure of other maker's cameras but if you don't know or don't remember a feature the help button will nudge you. The customizable individual lens focus adjustment feature is the cat's meow. My aforementioned Sigma 30mm lens has never focused properly and I was able to quickly adjust this in-camera. Henceforth, all my pictures taken with the Sigma lens will at least be properly focused! OK, one of my favorite features; the intervalometer. Ooooo, Ahhhh. It can be used by itself or with multi-exposure. By itself you can set it up to take pictures at whatever interval you like. This can be great fun. I set it up on a tripod at our reunion to take a picture every minute while we were playing cards, even catching my brother with Easter eggs over his eyes. This almost makes up for the lack of an infrared remote capability, though I guess they could not have included everything and to be fair, it is available with external added equipment. Multi-exposure is also pretty cool. More stuff to play with. Some observations; if you have an event coming up get the camera early and play with it. I was still figuring out the settings when I went to a family reunion and took 1500 pictures. Many of those were multi-shots of the same subject so I dumped the extras and ended up with around 500 good pictures. I took some group pictures and some were blurry because I misunderstood a feature or two. I take a lot of profile pictures and the only way to properly focus on these is to spot focus on the nose or eye. I would have liked a feature that recognizes a profile and focuses properly without changing settings. I guess that is asking a lot! Maybe in the next generation. The weight of the device is off-putting for some, though not for me. I have big hands and the camera fills them nicely and the "balance," the way it feels in one's hands when it is turned different directions, feels just right to me, similar to the way a well-balanced 18v cordless drill feels. Though heavy, the weight is evenly distributed and it can be turned and manipulated without strain, at least not for me. The battery life for me has been less than the 1000 pictures others have been getting. More like 500 or a little more. I'm not sure if this is because of the VR lens because I have not used my Sigma much yet. 500 is still a lot and I am not unhappy with this. The only other "issue" if you can call it that is the front aperture dial; My finger sticks to the rubber around it which makes it more difficult to turn it. Just a nit-pic (pun intended) and something I will get used to. Overall, I can truthfully say I love it. It doesn't get much better than this! Since I moved from the D70s to D300 it has further increased my pleasure to press the gentle button to capture a moment. This camera is extremely stable, especially with the VR function in the Nikon Lens. The menu has many choices to enable specific photography. Also the continuous shooting is a real improvement and makes very beautiful action-pictures. Very pleasant is its LED matrix focus device that can be seen in the viewer. Real super technology for the amateur/professional photographer. Amazon.com is giving the best price/package ratio, after my search on both the web and specialized shops in the DC area. Bought this D300 with 18-200mm package based on the all reviews here for Alaska vacation just week before we left. Pictures came out good to poor and wildlife/landscape pictures came out very soft to soft at 200mm. Lens is not sharp as lot of pics shot wide angle 18mm and telephoto 200mm are soft. Disappointed. Also, lack of experience with Nikon D300 may have hurt me. Initial pictures were shot with RAW+Fine JPEG (14 bit loseless uncompressed) but that slowed D300 in taking pics and took up lot of memory so switched to fine JPEGs with optimal quality. That worked fine. Found Noise in the pics after came home as I had not changed factory camera settings and auto ISO caused some shots taken at 400-800 ISO with noise. Also, somehow factory settings had all my pics shot as bracketed 0EV and then next one -1.0EV for all of them. This will ruin my panoramic pics of landscapes and make my job harder in trying to correct it. I would rate this camera with 18-200mm VR II lens package 3 stars based on picture quality and performance. Complex menu system with lots of options. Also, I would like to see Nikon include robust RAW software free instead of buying it. Hopefully with more experience and lot of manual reading this camera will allow me to take better pictures. Have my new Nikon 300D with 18-200 lens approx. a month. Just returned from 2+ weeks in Alaska and my pics are great. Have been playing with different settings and if one reads the manual or some of the excellent guides that are available all should be smooth. A camera for the here and now and for years to come. A winner in every sense. Experiment and you will be rewarded. I use my polarizering filter and the results are great. If you want quality construction and Nikon reliability get this camera. All other manufacturers strive to equal this one,so why get a 'knock-off' ? Great for anyone who loves photography and wants more than holding your camera at arms length to capture those memorable times. No different than reading a book or just picking up a synopsis . The first, the very first image from the Nikon D300 with it's 18-200mm lens (all around lens for me) showed me I had made the right choice. flag. On the computer screen I could see the stitches in his pants and some loose threads hanging from the flag's edge. I did SO much research before buying this camera, originally thinking I'd get the Canon Rebel XSI... This lens is amazing, it's so powerful and versatile that when I compared it to buying the Canon body and 2 Canon lenses that would cover a similar zoom range, the Canon option stopped making any financial sense. I'm extremely happy with the photos I've taken with this guy, from massive gigapixel panoramas to HDRI to action shots at the dog park. It makes photography as simple as you need it to be or as precise as you want.